“Peas Porridge Hot peas porridge cold peas porridge in the pot nine days old”, an old nursery rhyme dating back to sometime during the 1700's, but dry peas were in use long before that. Dry peas have been around and used by mankind for thousands of years. Growing them can be fairly straight forward. And the rewards can be great knowing that you were able to produce your own shelf stable crop, for use anytime they are needed. Peas are in fact a legume but considered a starchy vegetable by some. 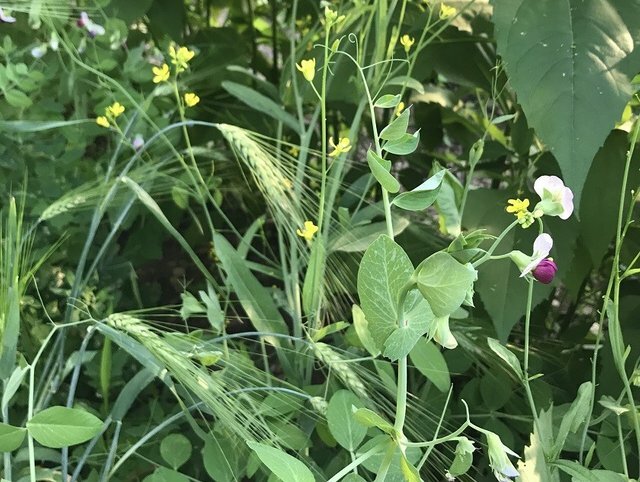 There are two main types, garden peas and field Peas. Garden peas include snap peas, snow peas and sugar peas. We aren't going to talk too much about those today. But the same growing conditions apply to these as well. And then there are the field peas or dry peas like 'Carlin peas', an heirloom variety and then of course split peas. Now mostly grown from commercial cultivars like 'Alaska'. I'm going to grow one this year called the 'Wild pea of Umbria'. This pea has origins in Italy and have been harvested there since Neolithic times. 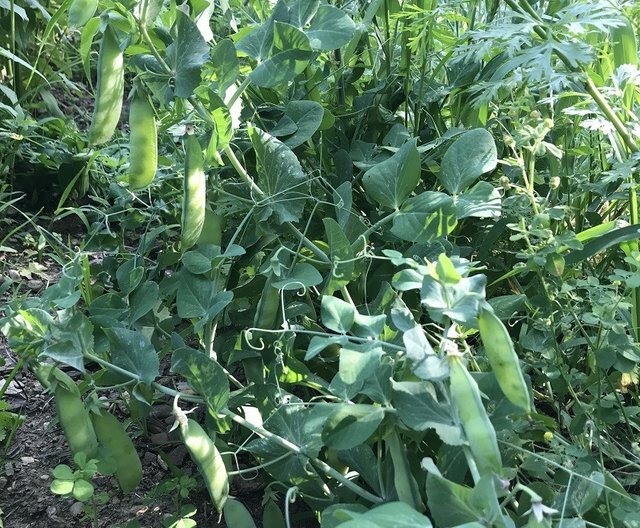 Peas are a cool season crop with 4-9 seeds per pod and vines three to four feet long, they usually need some kind of support. Peas can be green or yellow, sometimes even red depending on the cultivar. 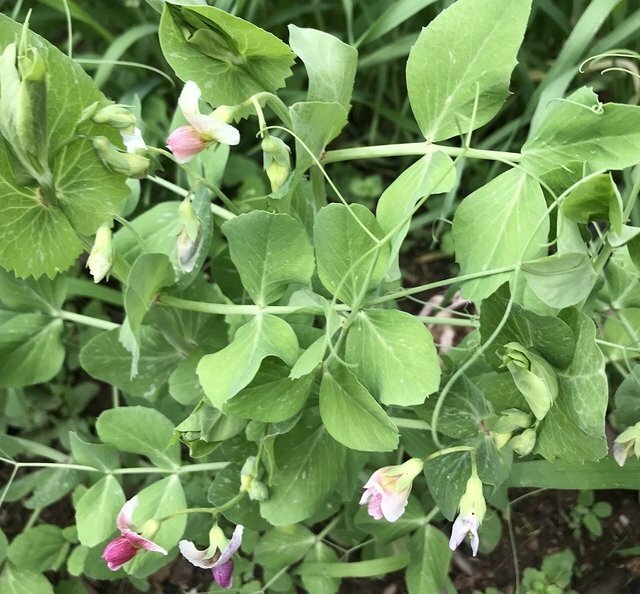 Seeds of the pea can be planted when the soil temperature reaches 50 degrees and until the soil temperature is as high as 65 degrees. But any warmer than that, and seed germination starts to suffer. Let me repeat that. Seed germination suffers. These plants like cooler temperatures. They have trouble setting pods in warmer weather. That's why it's important to get them in early. Here in Michigan I've planted pea seed in the ground and had it snow two days later. It was two more weeks before anything emerged. By the time early summer was upon us our garden was full of pea pods. You've got to get them in early for the best results. The other nice thing is that peas have a relatively short growing season. You can be enjoying garden peas before the tomatoes start to set fruit. Peas fix nitrogen in the soil, so inter planting with vegetables that need some extra nitrogen might not be a bad idea. Maybe some Swiss chard or other leafy greens at the base of your pea plants could be something to try. Once the seedlings are up they will withstand most frosts. If frost damage does occur it is possible for the plant to grow from any nodes below the soil. You should think about that for a second. Usually when a plant emerges, the seed leaves are above the soil so there are no nodes below the soil. For early spring plantings of peas it might make sense to bury the seeds a little deeper. Then maybe do some hilling once they emerge to purposefully put a node or two under the soil. Just in case there's a late freeze. You should note that peas do not like to be transplanted. I've tried. They literally just sit there doing nothing for ages. Especially if set out too late in the season. Learn from my mistake, it's best to seed them directly in the soil. Also peas have edible foliage and their delicate tendrils and newer leaf growth make excellent additions to any salad. That being said, we aren't the only beings attracted to this wonderful plant. Slugs, Rabbits, Woodchucks, Deer and the like will mow them down if given the chance. Especially after a long cold winter. These critters will be looking for tasty new shoots and forbes to eat. So take measures to protect this crop accordingly. Peas are full of antioxidants and phytonutrients that can help you be healthy! They are also very filling and satisfying. Peas can be added to many recipes, or they can make a meal all on there own. Split pea soup anyone? Peas have a fair amount of protein but do not have all of the essential amino acids. I think they are missing only one amino acid. So just make sure to eat a varied diet. Especially if you don't consume meat. Peas are actually a starchy crop similar to potatoes but with somewhat fewer calories. This is still a great calorie crop to include in your garden and diet. Especially if you choose an heirloom variety that can be eaten at different stages of pod growth, but still makes good dry pea. As stated before Peas are a short season crop. If the weather doesn't cooperate for longer growing vegetables, you can still get a crop of peas out of your growing season. I spent years loathing the pea. I would only eat split pea soup. How could I like that but not other peas? They were terrible, one time my Mom wasn't home and so my Dad cooked dinner for my brother and I. I remember it being Salisbury steak, potatoes and green pea's straight out of the can and rolling around on my plate. I remember them getting cold very quickly so I didn't want them. I ate all my other food. My Dad wanted me to eat them and made me sit there until I ate my peas. I know I didn't finish them, I just remember cold peas popping in my mouth when I bit down on them. It wasn't a pretty sight. I don't remember if I got my hide tanned for not finishing them, but I truly think that's all it took for me to hate them. I was probably five years old when that happened. I've got a policy with my own children. I try to get them to eat new things. If they don't want to, I don't make them. A lot of times, some of the kids will try it and like what I've made. Others will try it and be very open about their disgust. But they have at least tried it. Everyone is different, it still amazes me how even our own children are so different from one another. After many years of my own unwillingness to try new things, I decided to buy some pea seed for several pea varieties. I wanted to try different ways of eating them just to see if it's just all in my head. I'm actually starting to come around. 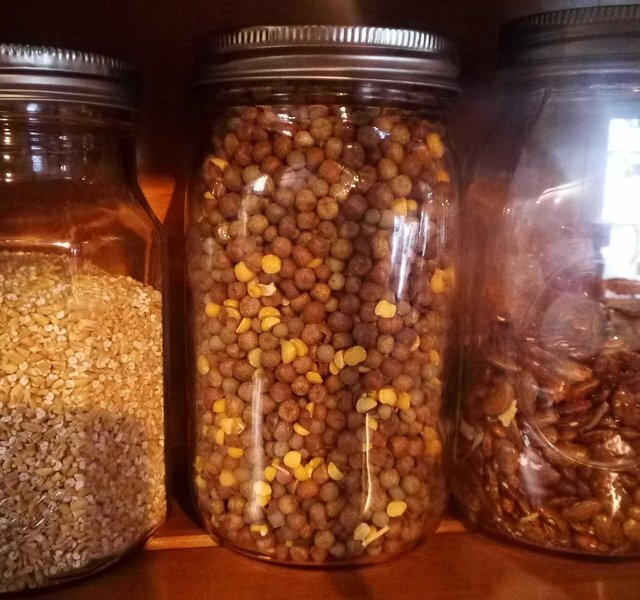 There are many ways to cook dry peas. You can add them to Curries. Or soaked boiled, then fried in oil. They become crunchy when cooked like that and seasoned. They do that in parts of England. Cooked into patties with herbs and spices. Also add them to soups and stews. You can even grind dry peas into a flour for use in recipes. In the end, all I ask is that you give peas a chance. 😌 They might just surprise you. Congratulations, your post has been selected to be included in my weekly Sustainability Curation Digest for the Minnow Support Project. I am about to plant peas this week! Your post is timely :) I was the same with peas when I was younger but I have a new appreciation for them as a gardener. They produce abundantly and, best of all early! I have a bunch of dried peas from last year and after I see how many I plant out this year I look forward to eating the rest. There are so many ways to use them. I'm glad to hear you are getting some in the ground. I've got to wait a while longer. I got some seeds planted (favas, coriander, spinach) , just when I was about to plant peas it snowed and the ground froze enough to deter me. And another storm coming in, so I may have to wait a bit longer after all!